Looking for some flat water holiday spots to learn to windsurf – Planet Windsurf Holidays – give us their guide. 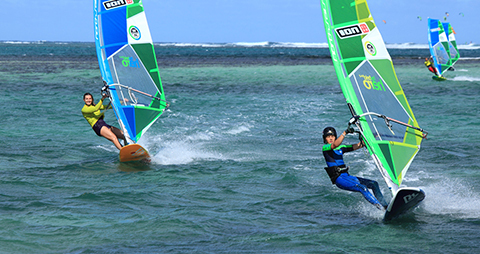 Widely recognised as one of the very best windsurfing destinations in the world because of the warm flat water and reliable wind, Le Morne is perfect for those looking for a luxury learn to windsurf holiday. 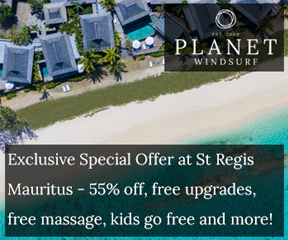 Planet Windsurf Holidays offers incredible exclusive rates at the luxury St Regis hotel as well as the super luxurious St Regis Villas. 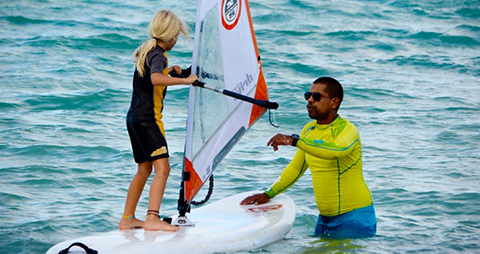 With a large range of facilities available at the resort, this is the perfect destination for those travelling with non-windsurfing partners or family members or that simply want the all-inclusive experience. 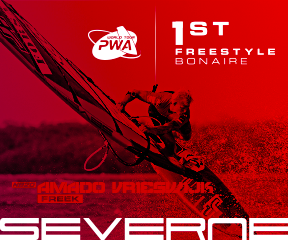 Bonaire is the best windsurf location in the Caribbean, and perhaps the world. Here a well stocked windsurf centre and a very good family-friendly hotel sit on the beach of the huge, beautiful flat water lagoon. This lagoon is one of the most perfect and easiest windsurf destinations in the world, with wind almost all year round, peaking between May and July. 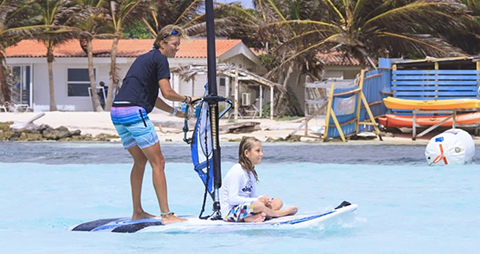 Apart from being an amazing windsurf location Bonaire also offer world class diving and so makes for an ideal windsurf / dive combination holiday. 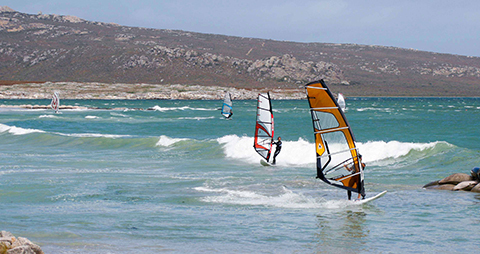 Langebaan is one of Planet’s top destinations for learning to windsurf. Escape the cold winter in the UK and Europe and head to South Africa between November and March where you can enjoy long sunny days and 95% wind reliability. Located about an hour and a half drive from Cape Town, the huge flat water lagoon of Langebaan is absolutely beautiful and a mecca for nature lovers and water sports enthusiasts. The lagoon at Langebaan is surrounded by a national park and the village centre offers a number of fantastic restaurants which provide the perfect place to relax and unwind after a physical day on the water. 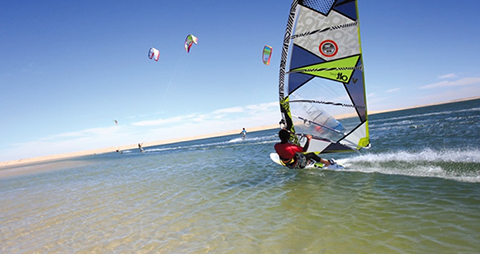 Offering year round sunshine, white sandy beaches, panoramic views of desert mountains, great wind reliability and a huge lagoon, Soma Bay in Egypt is one of the best places to learn to windsurf. 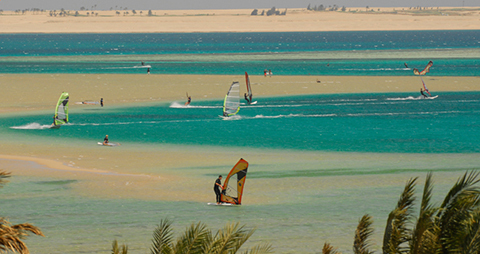 Soma Bay is a secluded spot for those wishing to just relax in luxury if not on the water, however, there are a variety of excursions, tours and day trips that you can combine with a windsurf holiday to experience the history and culture of ancient Egypt. Affordable Dakhla is a Planet favourite and Ocean Vagabond offers great bungalows located right on the water’s edge which are ideal for windsurfers with a fabulous restaurant, bar and windsurf centre on site. 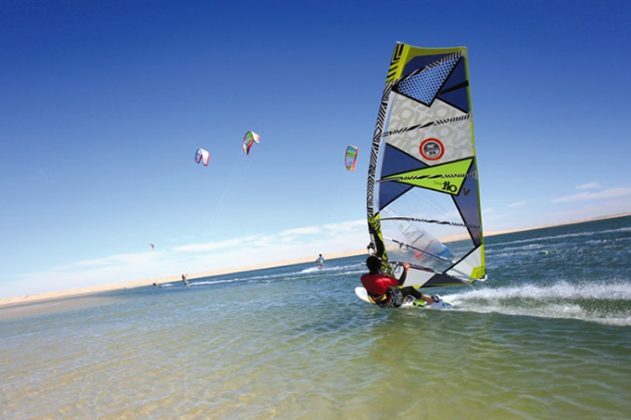 This unique spot offers an amazing flat water lagoon surrounded by the Moroccan desert and boasts clean, consistent wind virtually all year round. With reasonably priced accommodation and a relaxed atmosphere, Dakhla is ideal for those looking for a no fuss, no frills experience! Anse Le Raie is a great alternative to the busy, more well-known spot of Le Morne in Mauritius. An outer reef belt in this part of northern Mauritius creates a vast lagoon reaching out almost 2.5km from the shore line. The water in this lagoon is not shallow, but protected from the waves by the reef, so creating a huge flat water play ground for windsurfers. The wind is generally side shore by the windsurf spot, so this is also a very safe location. With some beautiful high quality boutique style beachfront properties in the area and a wide array of amenities, shopping and night life situated near by it is also a great destination for travelling as a couple or with your family. 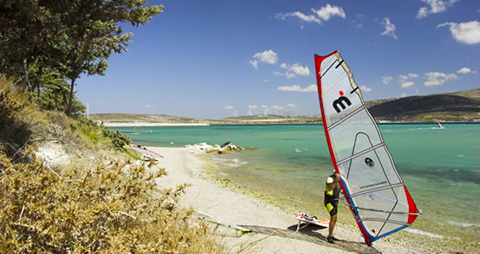 Although more of an estuary than a lagoon, Alacati is one of the best places in the world to learn to windsurf. With excellent windsurfing conditions offering butter flat turquoise water, reliable wind light winds, fantastic instruction and an excellent range of children’s equipment, this is a great place for all ages to get into the sport. The spot is situated in a huge protected bay, with a 500 metre long and 400 metre wide shallow area of shimmering turquoise water. In the south, the bay gives way to the open sea. The constant and reliable wind, which blows sideshore from the left in summer, and the absolutely flat water, create perfect conditions for windsurfers. Planet Windsurf Holidays are one of the world’s leading windsurf travel companies and only work with the very best and safest windsurf schools around the world, personally checked by their team to ensure the best standards. Be sure to contact them regarding a learn to windsurf holiday to any of these amazing destinations.